Here’s a cool solution to a common problem. My good buddy Doug needed a 5 string bass with an active circuit. Problem: December is a tough month to be investing in an expensive bass, but his need was immediate. 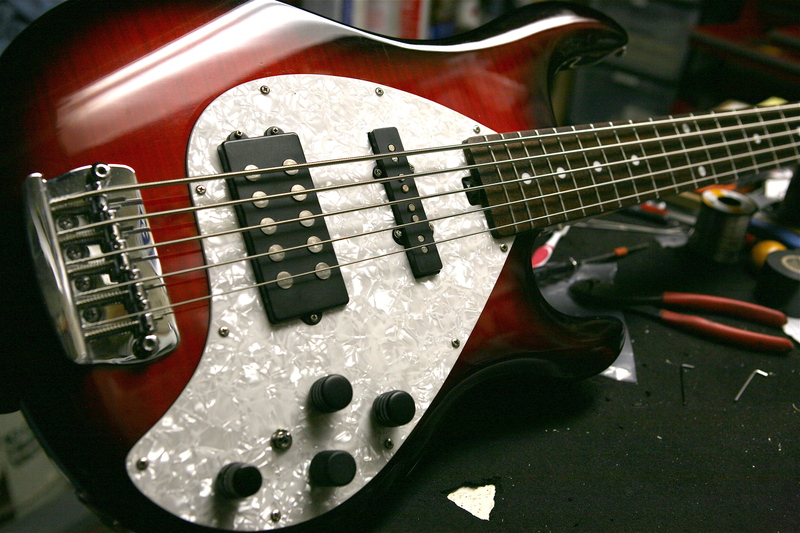 The solution: we found an inexpensive bass with lacking electronics and performed an upgrade. Doug has always been fond of Lakland basses with the pickup configuration of a Music Man Stingray style pickup in the bridge position and Fender Jazz Bass pickup in the neck position. 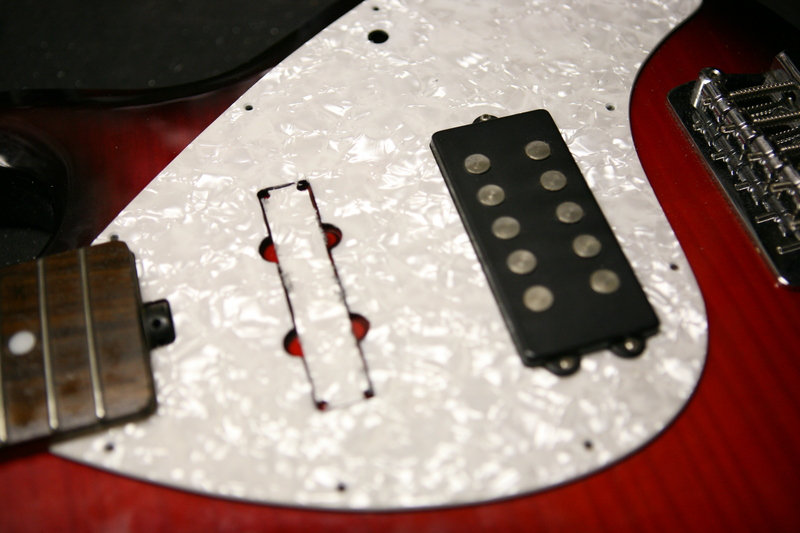 So we started with this OLP brand passive version of a Stingray 5 String and gutted everything but the bridge pickup. Then the fun began. I carefully located and traced where I wanted the new neck pickup to go. Then I routed the body and installed a compatible neck pickup. In this case the best match was a Fender Standard Jazz Bass 4-string pickup. The pole pieces easily covered the width of the 5 string’s span. I followed up with a 3-band active EQ circuit and a coil tap switch for the bridge pickup, allowing for the standard Jazz Bass configuration of 2 single coil pickups. Lastly, I removed the soft plastic nut and replaced it with a hand-carved bone nut. After a full set-up package and a new set of strings it was time to plug in! I must say that both Doug and I were more than surprised by the results. This configuration proved to be very versatile and useful. He called me the next day to say that it was the best sounding bass he’s ever owned. Doug has owned some pretty high-end basses in the past, so this is really saying something. This whole project cost less than $600, including the bass! It was a huge success! I love it Joe. Hard to believe how little I spent on such an amazing bass. First time I have owned a 5-String that I payed less than a thousand for, and yet it definitely holds up to the others…Great Job!!!! ya, got my 1995 USA ray done with a marcus miller 5 string jazz neck pickup. It worked a treat. Of course EMG aguilar electronics were used.